Beth El believes in the importance of community and supporting our members, and we have made a commitment to provide several weekday Minyanim (daily services) to offer support for congregants who are in mourning or who wish to mark the Yahrzeit of a loved one by reciting Kaddish. 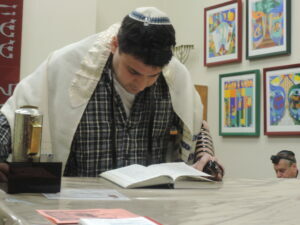 To ensure we have the minimum of 10 Jewish adults (age 13+) required in order to recite Kaddish and some other prayers, we ask each of our congregation members to attend Minyan a few times a year. The names of those asked to attend during the current month can be found in the Shalom or in Beth El’s E-Newsletter. We have many regulars who can answer questions and guide you through parts of the service. These services can also provide you with a casual way to learn different parts of the service, brush up your Hebrew, reflect on your day and get to know other people in our Beth El family. Please help your fellow congregants by making a commitment to attend when you can. Let us know if you have a Yahrzeit, and whether you would like to lead a service. * Minyan moved to Shiva house when necessary. Call office to be included on e-mail chain of life. ** 7 am on Rosh Chodesh, Chanukah, Chol Hamoed and Fast Days – refreshments provided the first Thursday of the month.